Which Timber Floor is for you? The original, and some would say, the BEST Kiln dried hardwood tongue and groove flooring has a structural quality, which means it can be laid directly to the floor joist, over concrete, plywood or battens. Also the end-matched board does not have to be nailed over a floor joist. It is available in secret nail or top nail profile and is available in a huge cross section of colours, price range and widths. Using bigger blocks of timber creates block parquetry timber flooring. It is extremely effective when laid with contrasting coloured timber to create patterns and designs. Parquetry is precision milled and designed to be glued down over a solid, flat sub floor such as concrete, plywood or particle board. A man made product pre-coated natural timber laminated boards resting on a thin foam underlay which can be laid on virtually any base. The boards are extremely stable. Floor Solid timber overlay is REAL WOOD; in fact it is essentially traditional tongue and groove timber flooring only thinner. Timber engineered floor is constructed in a special cross-ply configuration making it extremely stable. The overlay floor has a full 3.6mm solid timber wear layer, which is laid up on 11mm structural plywood. The extra thick wear layer means you can sand and re-coat for many years. As pre-finished in most case an average sized room can be completed within one day. For long life, timber decks should be built from a naturally durable such as Ironbark, Tallowwood, Spotted Gum, Jarrah and Blackbutt, and either sealed with water repellent or oiled with decking oil or preservative. Available in cross section of colours and widths with pencil round profile. DOES THE PRICE OF YOUR TIMBER AFFECT QUALITY? No, Nash Timbers prices are very competitive due to our buying capacity and our long time experience in the new and recycled timber industry. We pride ourselves in providing quality timber form sustainable managed Australian forests. ARE YOU ABLE TO SUPPLY ECO SELECT TIMBER? The ecoSelect brand empowers you to choose natural hardwoods from Australia’s sustainable managed forests. It is better to ‘work the forest’ than ‘lock it away’. “ CARBON DIOXIDE “ absorbed by growing forest. “CARBON DIOXIDE “ omitted by decaying forest. WHAT COLOUR IS FOR YOU? Colour of the timber will be determined by the species, natural variations can and do occur. Timber is a natural product providing a broad range of colour variations across the 3 main spectrums of creams, browns and reds. When choosing Nash Timbers encourage our client’s to see the true colour variation in each species. DO BOARD WIDTHS AND THICKNESS VARY? Large variations in sizes are available for our clients. Wide floorboards starting at 240mm down to narrow 60mm and 19mm to 30mm in depth depending on the requirements of each individualized site. The wider the timber board, the greater the natural shrinkage and expansion across the face of the board, it is highly recommend that a wide board be loosely laid up to four weeks. As a general rule, Timber Flooring laid along a room will make it look longer, while boards laid across a room will make it look wider. WHAT LENGTHS DO FLOORBOARDS COME IN? New timber flooring is supplied in random lengths packs where individual timbers range between 0.9m to 5m….and no, you cannot select or specify long lengths only! WHAT DO YOU MEAN WHEN YOU TALK ABOUT DIFFERENT TIMBER GRADES? WHICH TIMBER IS MORE RESISTANT TO FIRE? HOW DOES THE HARDNESS OF THE TIMBER AFFECT MY DECISION? For general domestic purposes, hardness is negligible. The timber hardness rating (expressed in Janka) refers the flooring’s resistance to abrasion or indentation. Hardwood timbers are also considerably harder to work with in terms of sawing, planing and drilling. In high traffic areas, such as restaurants and foyers woods with Janka ratings 5.0 and above are recommended (Durability Classes 1 and 2). Structural timber is best if devoid of knots, large gum veins and sloping grain. Strength is measured in terms of "stress grades". Both Janka and Durability Classes should also be observed. DO TIMBER FLOORBOARDS NEED TO BE ACCLIMATIZED? Most certainly. Timber is a natural product. It will breathe, take in moisture and dry out throughout its life. Drying, shrinkage and moisture expansion are the most significant issues that impact on floor laying and floor laying environments. They have to be carefully managed in order to successfully lay a floor. The simple rules are (a) never lay a floor during weather extremes; (b) make sure your new floor is fully acclimatised before it is glued and nailed; and (c) ensure your floor can be kept dry. Floors can only be laid when the roof is on and all wet trades have been completed. Floors need to be properly acclimatised.. This is best achieved by laying the floor in position (not glued or nailed) until such time as it has acclimatised. If it is not possible to do the floor should at least be 'stripped' out and stacked in the same room where it will be laid. We deliver floors with approximate 12% moisture content. For every 1% change in the moisture content of the timber, over a width of 1 metre a timber floor will expand or contract by 2½mm. Therefore when dealing with floors several metres wide this movement can cause very significant issues that may result in floors 'doming' if the boards have no where to go or gaps appearing between the floor boards. To manage this expansion and shrinkage, timber floors have to be acclimatised to the local environment. (NB: the movement is mostly evident across the width of a board rather than the length). Concrete:- every 25mm of concrete slab requires approximately 1 month to dry before a timber floor can be laid - i.e. timber can only be laid on a 150mm slab after 6 months. Slabs must be moisture tested before laying down timbers (below 5.5%). There are moisture membrane products available to restrict the concrete from sweating. (Laying plastic down on the slab does help but does not overcome the issue of moisture expansion and contraction). CAN I SECRET NAIL A TIMBER FLOORBOARD WIDER THAN 80MM? No, the accepted practice that you should not secret nail a floorboard if it is wider than 80mm. CAN I STOP THE GAPS APPEARING BETWEEN MY FLOORBOARDS? Not really, timber responds to seasonal variations in temperature and humidity absorbing moisture or drying out, thereby effectively swelling or shrinking with seasonal changes. Wide gaps or irregularly spaced wide gaps generally indicate the recommended acclimatising procedure has not been followed. DO I NEED EXPANSION JOINTS? Yes, every 6mts with 10mm gap. With a wide board over 130mm cover a 13mm gap is required at the perimeter. This allows for floorboard expansion. WHY DO YOU ALLOW FOR TIMBER WASTAGE? Allow for wastage for loss through cutting at walls, doorways and nooks etc…If the floorboard is end matched allow five-percentage wastage. If floorboard plain-end allow ten-percentage wastage. IS NASH TIMBERS ARE TO INSTALL MY FLOOR? Yes, we supply fix and finish within a package. HOW MUCH DOES A FLOORBOARD COST? HOW MUCH TO INSTALL, SAND AND FINISH A TIMBER FLOOR? CAN NASH TIMBERS HELP WITH SOUND PROOFING MY TIMBER FLOOR? The two types of sound that acoustically needs to be focused on when it comes to floor. Low frequency sounds, impact vibration such as footsteps and airborne sounds such as voices and music. Acoustic Isolation involves limiting the amount of sound that is heard by using a sound absorption material combined with modern batten systems and the use of plywood. By using these acoustic systems we reduce the transmission of impact noise and meet the acoustical requirements of residential living. The overall appearance of a timber floor is enhanced by the manner in which the flooring is finished. Coating choices are very distinctive so it is important to select the right system for a predetermined look and feel. Always test a surface before you apply the final finish (oily woods – such as tallowwood and spotted gum which feel ‘waxy’, are notorious for rejecting certain preservative finishes). If a finish is rejected restart the process with an oil sealer. Decking Timber use a penetrating oil for best preservation. WILL I GET VALUE WHEN DEALING DIRECT WITH NASH TIMBERS? As such we feel that we can match your existing suppliers prices and services and our business focuses on building a solid customer and supplier relationship. A must for any architect, designer, engineer or builder who specifies or uses timber in designing a project. 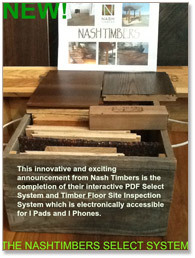 Exclusively from NASH TIMBERS, this new and unique select system allows our clients to make an intelligent & informed choice of timber requirements by using our Interactive PDF Program that guides you through different timber options from colour, types of timber flooring and finishes, grade, widths, heights, lengths, durability, hardness & sustainability. All aimed at giving you the most suitable and “intelligent” outcome - To help make your timber selection more process and guided based we take you through a path of chooses which lead you to your ideal floor. We take great care in liasing with our client over the installation and finishing of the flooring. it is important to take the client through each stage of the process, so they have a more informed understanding of how timber works.